This Electrical Power Calculator helps you compute the power consumed by electrical devices. Do you want to know how to calculate electrical power? Are you wondering: what is the power factor? Just read the text below to find out. P [W] is the power. where the new symbol PF stands for power factor. In AC currents both the current and voltage vary periodically in time. The values I or V correspond to the root mean square (RMS). RMS is a square root of the mean of squares of numbers. The commonly referred voltage of electrical outlets (230 V in EU and Australia, 110 V in the USA and Canada, 100 V in Japan) is the RMS voltage. In the AC circuits, the current and voltage might not be in phase. The maximum value of the current might be ahead of or lagging behind the maximum value of the voltage. This makes the transfer of power less effective. In the worst case, when the current and voltage are entirely out of sync, the transmitted power is zero. The power factor tells us how synchronized is current with the voltage. If they're in sync, the power factor is 1. Otherwise, it is less than one, reaching zero in the completely out-of-sync case. The power factor depends on the device. For a device that is purely resistive, like an electric kettle or an electric heater, the power factor is 1. A device with inductive or capacitive elements puts the current and voltage out of the phase. This makes it power factor less than 1. Check the power factor calculator to learn more. inductive oven: PF = 0.85. The exact value of the power factor depends on the details of the construction, so take these values with a grain of salt. 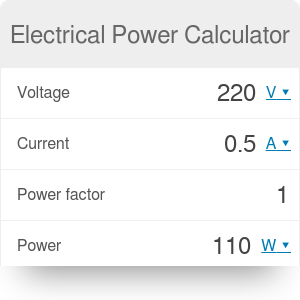 Electrical Power Calculator can be embedded on your website to enrich the content you wrote and make it easier for your visitors to understand your message.